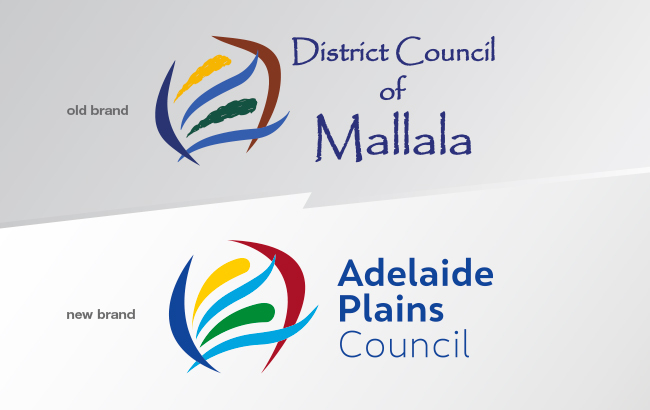 The District Council of Mallala recently voted unanimously to change their name to Adelaide Plains Council to better reflect the district and community the Council represents. A new name often requires a new logo but the Council felt the narrative around the existing brand, logo and graphics still told the story of the region well. Algo Más were engaged to review the existing brand and make recommendations as to how the Council logo could be updated to reflect the new name, while still retaining its meaning. The existing logo design is based on the concept of the land use and natural landscapes in the district. The Council is bordered by land on the northern and eastern boundaries and by the sea on the west boundary. There are two rivers that cross the district from the east to the west. The land is used for farm cropping and the growing of vegetables, vines, olives and natural vegetation. Using this concept the Deep Red and Dark Blue shapes in the logo depict the borders of the area, a Light Blue depicts the two rivers, Yellow depicts the crops of wheat and Green depicts the horticultural and bushland. Within a tight, two week timeframe Algo Más worked with the existing brand elements to create a new, more modern, relevant logo by adding the new name in an on trend font, a more vibrant colour palette and tweaking the graphical shapes. The result is a cost effective, easily implemented, brand refresh that is still familiar and representative of the district and community. To complete the process we developed Brand Guidelines to assist future brand ambassadors consistently implement the new brand and logo.